The retina contains both veins and arteries. These blood vessels can become blocked or “occluded” causing different types of complications in the eye including vision loss. All cause sudden painless loss of vision and usually affect only one eye. Vision loss varies. While treatments do exist for all types of RVO, visual improvement varies among the four types of RVO. The there are two major groupings of vascular occlusions, those affecting the veins and those affecting arteries of the retina. The two differ in the amount of retina which is involved. Central retinal vein occlusions involve the entire retina whereas a branch occlusion usually involves 50% of the retina or less. Vein occlusions are not usually associated with systemic disease and is usually attributed to normal hardening of the blood vessels. Certain diseases such as diabetes or hypertension may increase the chances of a vein occlusion, but they do not directly cause the occlusion. 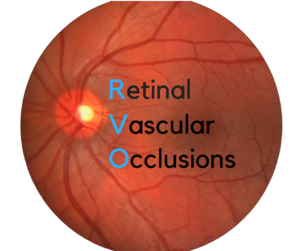 Similar to the venous occlusions, central vein occlusions affect all of the retina whereas a branch artery occlusion affects 50% or less of the retina. Artery occlusions are caused an embolus; a blood clot, cholesterol plaque, fat or platelet ball which physically plugs a blood vessel. Most artery occlusions are caused by a piece of cholesterol plaque that breaks off from the carotid arteries. Vision loss is usually severe and permanent with central occlusions. Vision loss from branch artery occlusions are not as severe, but tend to cause permanent blind spots. Systemic evaluation is necessary to assess a patient’s risk of stroke - which is caused by the exact mechanism of an embolus plugging an artery in the brain.